When the Opportunity rover landed on Mars last year, scientists werethrilled that it made a cosmic "hole-in-one" by rolling into a crater. But now therobot is struggling to drive itself out of a sand trap. Time will tell whetherit's up to par for the task. 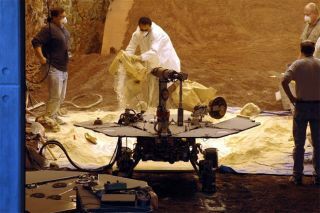 Progress isbeing made on trying to remove Opportunity froma soft-sand dune that the sporty, six-wheeled utility rover has run itself intoat its exploration site: Meridiani Planum. And onMars, there are no tow trucks, at least not yet. So who are you going to call? "We'regoing to be ready soon to start making our move at Meridiani," said SteveSquyres, lead scientist from Cornell University for the MarsExploration Rover (MER) effort. Squyresnoted on a Cornell web site devoted to the MER project that a long hard week oftesting was undertaken at NASA's Jet Propulsion Laboratory(JPL) in Pasadena, California. At JPL, engineers,scientists, outside advisors, and even the project manager have been mixingsandy and powdery materials, digging holes and building dunes - all in anattempt to figure out how best to get Opportunity out of its dune fielddilemma. Theteam is also busily working on why the robot dug itself into the small dune,and what added safety-in-driving tips to follow in the future. Theblend of sandy and powdery material brought in for testing purposes matched theway the soil has worked itself into spaces between the cleats on Opportunity's wheels. "Wetested with one mix of materials, decided it wasn't quite nasty enough, andthen made the mix nastier and tested again. We tested getting the rover stuckand then unstuck in a bunch of different configurations, some of which we thinkwere worse than the one we've gotten ourselves into on Mars," Squyresexplained. "The goal of this kind of testing is to be 'conservative'...to test under conditions that are at least as bad as -- and preferably worsethan -- what you're dealing with in reality," Squyres observed. Soon itwill be time to put to practice what the tests have shown, Squyres said. "We'velearned quite a bit," he said, pointing out that it can take a lotof rover wheel turns to move the Mars machine from a configuration like the onein which it now finds itself. "And whileit's tempting to go for it all in one shot, the smart approach is to becautious about it and do the job in small steps. So that's what we're going todo," Squyres added. Moving soil bit by bit beneath Opportunity'swheels, to enable the extraction process, is going to take time, he concluded. Is it toodangerous to press forward, perhaps better to have Opportunitybacktrack and head for safer ground? "Why goforward? You could have asked us that question at the beginning of themission...before we even launched the rovers," Squyres responded to SPACE.com. "You go forward because theeasy stuff has been done." Squyressaid that the rover science team has looked at the plains, down into littlecraters, and know what a lot of Meridiani Planum is like. "You don'tsucceed in a mission like this just by keeping the rover alive and staying outof trouble. You succeed by pushing hard and finding new things," Squyresrelated. Before Opportunity reached the etchedterrain in which it now sits, the scientist did caution that this landscapemight turn out to be some impenetrable barrier. "And whoknows, maybe it will be. But we were prepared for that. The risks involved inexploring the etched terrain are part of why we spent so much time at EnduranceCrater. We had a scientific gold mine there, and we wanted to work it for allit was worth before taking a risk in the etched terrain," Squyres emphasized. While Opportunity and Earth controllers have hit their firstimpediment, Squyres stressed it's forward ho for now. "You workto overcome it, and then you move on. But are we going to back away fromunknown territory on the horizon, back to the safe stuff we know, because we'vehit one obstacle? Hell no," Squyres said. "If it becomes clear that we reallycan't drive in this stuff, under any circumstances, then yeah, it'll be time tofind another way to use the vehicle. But we're nowhere near that point rightnow." While rover operators workout the plan of action, Opportunity is imagingthe plains of Meridiani Planum and performing atmospheric science observations. In the meantime, on theother side of Mars, the Spirit rover continues its study of the Columbia Hillswithin Gusev Crater.